Earn $8.50 in VIP credit (850 points)What's This? 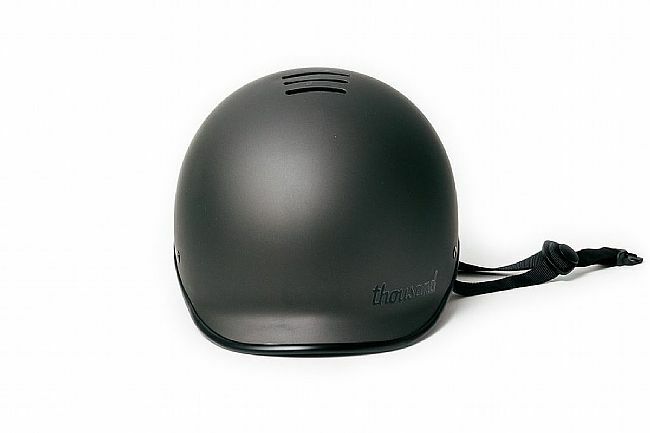 Thousand’s Heritage Collection Helmet features a sophisticated, Mod-inspired style and innovative technologies geared towards comfort, security, and ease of use. Weighing 450g (size medium), the Heritage Collection Helmet is lightweight without sacrificing impact durability. With two sets of interior padding options, the helmet can be customized to the wearer’s specifications, ensuring a secure and comfortable fit. Equipped with seven exterior vents and three internal cooling channels, the Heritage Collection Helmet is well ventilated so the wearer stays dry and cool. One of the most remarkable features of the Heritage Collection Helmet is its Secret PopLock system which makes it possible to lock the helmet to most standard bike locks including U-Locks, cable locks and chain locks. 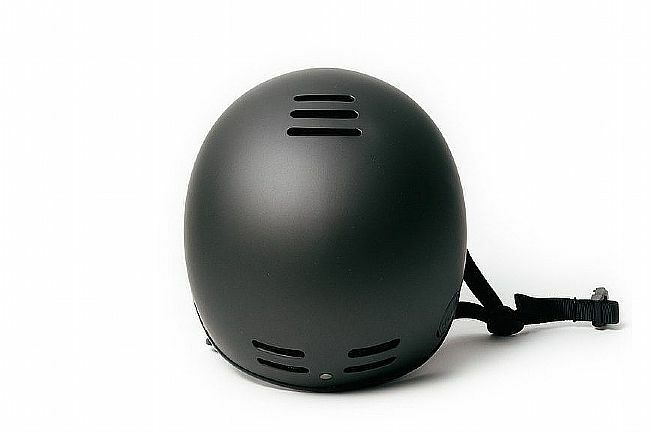 Thousand is so confident in its patent-pending Secret PopLock system that they’ll replace any helmet that is stolen while secured with the Secret PopLock system. Another great feature of the Heritage Collection Helmet is its magnetic strap clasp that’s so effective it can be fastened and unfastened with one hand. Two sets of interior padding. Head Circumference 21"-22" 22"-23" 23"-24"
Comfortable. Looks great-unexpected, abundant positive comments. Protects my head. 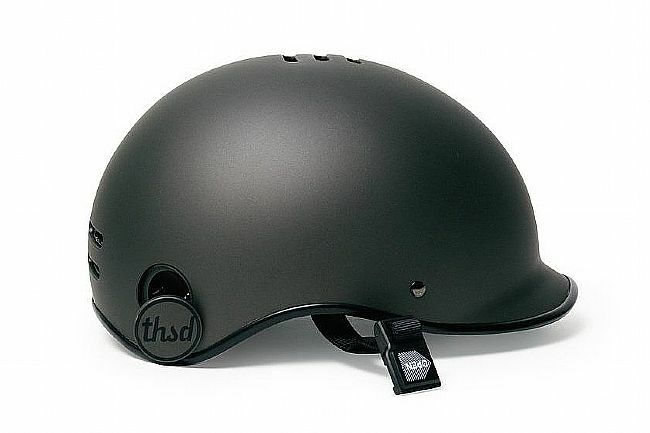 This is a great winter helmet. Vents are easy to tape and bill keeps rain drops off your face. Light, comfortable and great clasp. 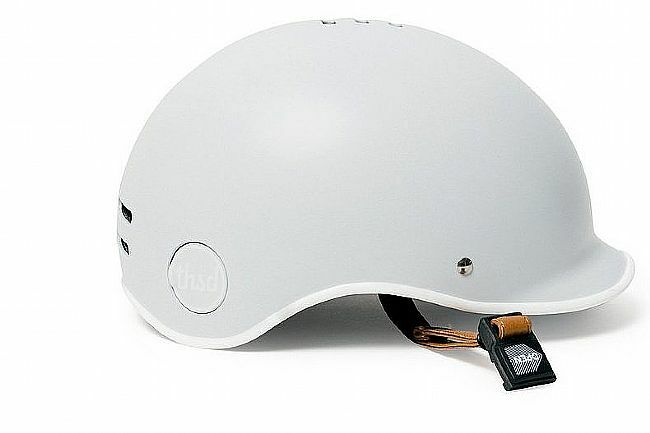 Expensive but very cute matte white helmet. The visor is pretty small and doesn't help a ton for keeping sun out of eyes, but doesn't obstruct vision at all either. Although ventilation holes look more minimal than most helmets, I haven't noticed it being any hotter than others. I have a pretty smallnarrow head and the size small was still somewhat large for me, okay but not snug. I've been using a poorly fitting, inex pensive Specialized helmet for almost ten years and finally decided to upgrade. 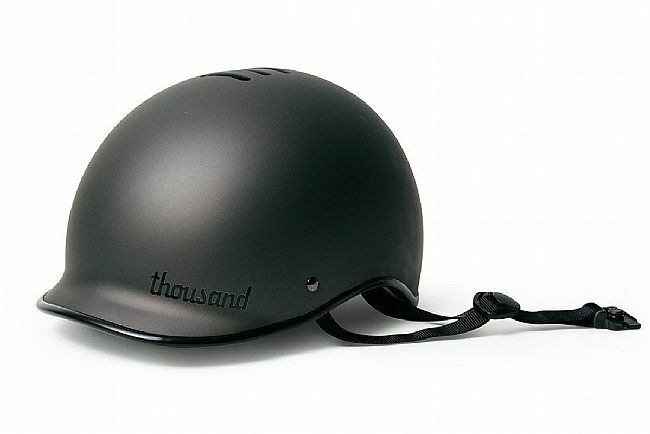 I eventually settled on Thousand as a stylish looking helmet that is not too expensive. First thing to note they run big, so go down a size if you're between two sizes. The magnetic clasp is cool and works well. The PopLock security thing is cool too, but if the vents were larger (which would make the helmet cooler-it is HOT), you could lock through the vents like I have always done anyway. The fit is okay-it moves around more than I'd like thought the leather straps are comfortable and easy to use. The finish is pretty mediocre the white piping has come unglued (after a week of use) and the finish is super is easy to scratch. Even being careful, I already have some noticeable scratches. The vents also cause the helmet to whistle if you ride at all fast-not really a problem, but still I wish they wouldn't. Finally, the pads leave an indentation on my forehead. Again, not a big deal-they go away, but I wish it didn't to it in the first place. It is a great attempt at a helmet, but for the price, there are other helmets out there that are better. I think this is a case of inexperience-there is nothing that's a deal breaker with this helmet, just little things that add up to enough to make it a don't buy in my opinion (unless you get a killer deal on it). If they redesign and release again, I would consider (carefully) the new design. But this one, I think find a different helmet. So to start out I just moved to Portland and figured why not embrace the biking culture here. So after doing my thorough research to find the right bike for me. 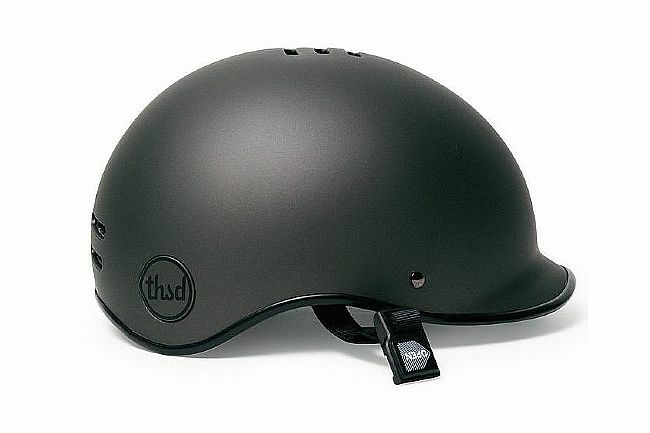 I realized I needed a helmet to help keep the old noggin safe from any unintentional bangs or bruises. But I was never a fan of those futuristic style professional cyclist helmets out there. I'm not training for Tour De France. I just wanted something that was stylist and doesn't have people steering at my already massive size head, enter Thousand Helmet. I stumbled upon this helmet after again extensively searching for a great stylist helmet. I first considered Bern but couldn't find my style in the designs they have. Plus I wanted something that I didn't have to worry about someone cutting the straps to steal it. 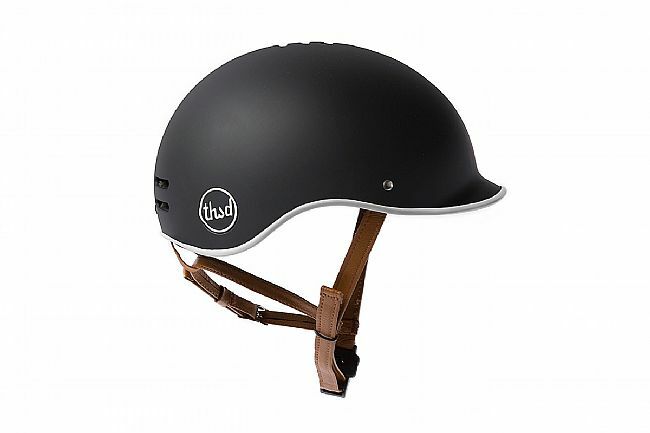 With the helmet created by Thousand I found that something stylish and also secure. It comes with removable padding to help adjust for different size heads. Also it has a port on the back that allows you to push your lock through to keep it with your bike. Also I get tons of compliments on it from folks everyday. It can be an eye catching piece. I recommend getting it in either White or Gold. I couldn't because again I have a very massive head and the darker colors don't seem so extremely large on me. But if I could I would be riding with a gold helmet right now. Also I like to support smaller or up and coming business and the team behind Thousand are running it from a garage right in LA area. So that is pretty cool. If you want more on them please visit the site and read up on how they got started. Very interesting story.